The Hulk is no humbug at Coliseum of Comics in Kissimmee, Florida. In some ways, a local comic shop looks no different from any other store this time of year. Business is up, the halls are decked, and customers new and old are on the hunt for the perfect gifts for loved ones. But while any store can put up a Christmas tree and generic holiday decor, some comics shops mark the season with geeky flair. At Austin Books & Comics in Austin, Texas, the tree is outfitted with Funco plushies, Dr. Who knicknacks and, of course, a Superman tree-topper. 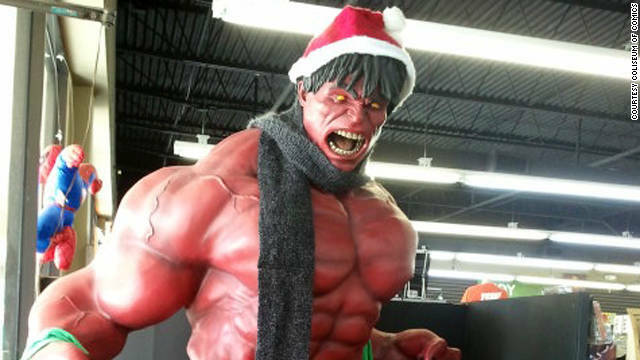 Walk into the Kissimmee, Florida, Coliseum of Comics branch, and you’ll be greeted by a 9-foot fiberglass Red Hulk statue wearing a Santa cap. The Man of Steel is the Christmas tree-topper there as well. Another sign of the gifting season at the comics shop? The newbies. Some shop owners and managers say there’s a definite spike in traffic in the weeks leading up to Christmas, and it’s not just the faithful who make the weekly pilgrimage to collect their new books. This time of year, there are more novices coming in to find the right gift for the comic book and gaming lovers in their lives. A comics veteran can walk into any shop and quickly find his or her way around. But someone entering that world for the first time might feel adrift in a sea of graphic novels and role-playing games. Brandon Zern, general manager of Austin Books & Comics, can usually spot the uninitiated right away. Coliseum of Comics general manager Brendan Boyle said the photo ops with Hulk are usually a dead giveaway. Fortunately, many comic shops operate a bit like specialty boutiques. The person behind the counter is most likely a fan who, with a little information, can guide a first-timer to good holiday gift candidates — not just comics, but items like collectible action figures and limited edition statuettes. The personal factor may be the biggest incentive for newcomers to head to a local comic book shop at Christmastime rather than a big-box store or online, especially if they’re uncertain of what to buy or where to look. “If you go to a comic shop, they’re going to be much better at finding something if you don’t know what you’re looking for,” said Greg Bennett, manager of Big Planet Comics in Washington. Zern said some gift shoppers steer clear of comics altogether, “because if they’re not a collector, they don’t really know what their loved one has.” That’s why merchandise such as tumblers, T-shirts and stocking stuffers like spinning Tardises tend to be popular. In addition to throwing holiday parties for patrons and holding Black Friday sales, Coliseum Comics offers a “Gift Guide for Geeks.” To make it even easier, the store gives regular customers the option of filling out a personal holiday wish list, complete with a small store map for the gift-giver’s benefit. Boyle said that things were different 15 years ago, when business tended to be slow in October and November and regular customers came in the week after Christmas to spend their holiday cash. But perhaps now that geek culture has gone somewhat mainstream, more members of the general public are testing the waters during the height of the season. The study, to be published in the juranol cheap louboutins, showed that eating low levels of carbohydrate changed bits of DNA. It then showed children with these changes were fatter. The British Heart Foundation called for better nutritional cheap christian louboutin shoes and lifestyle support for women. It is thought that a developing baby tries to predict the environment it will be born into christian louboutin pumps, taking cues from its mother and adjusting its DNA. Studies in animals have shown that changes in diet can alter the function of genes known as epigenetic change cheap louboutins pumps. They showed that mothers with early pregnancy diets low in carbohydrates, such as sugars and starch, had children with these christian louboutin slingbacks markers. The report says the effect was considerably greater than that of birth weight and did not depend on how thin or fat the mother was christian louboutin sandals. The changes were noticed in the RXRA gene. This makes a receptor for vitamin A, which is involved in the way cells process fat. Thanks buddy.I am searching this list since so many times . At the risk of "shilling", I'm a Coliseum of Comics customer (Sanford store, not Kissimmee, though) and I've never seen them treat the "uninitiated" woth anything less than respect; they're good people. I'd been out of reading/collecting for about 15 years and returned only a couple of years ago. I walked in, stopped – because it sure was different from the old Enterprise 1701 that used to get my business back in the 80's & early 90's, and I realized I was the oldest person in there – and was greeted by an employee, who upon hearing I was timidly returning to a once-loved genre, with no idea how it had changed, promptly turned me over to the store's manager, a guy who was willing to listen to a long list of my old favorites, writers, artists and books. He set me up a subscription – it's been revised a few times since – and I walked out a customer for life. It's the only place I go to where they shout out my name when I walk through the door! One of my local comic shops can be considered to be of the "unhelpful" kind. Honestly, I went digital so I don't have to deal with the less than helpful brick and mortar store employees any more. It's not that they are rude exactly, it's like some kind of annoyance at the presence whomever they feel are the unitiated. I used to enjoy comic chops, but not anymore. I'm glad some brick and mortar stores are still worth going to, just none within 100 miles of where I live. That is a shame. I got into comic books just a couple of years ago, when Buffy Season 8 came out. The folks at Excalibur were very friendly and helpful, and more than happy to show me how to look for things. That's what has kept me going back to them and has gotten me into many other series. They put all their comics in plastic bags, but are quick to tell folks that they can take the issues out and look through them. Last time I was in ABC I had an armful of trade paperbacks I was planning to buy, $100 worth or more, but I first stopped to ask an employee a few questions. The employee was more than happy to help, but then a manager or somebody came by and yelled at the kid for gabbing at customers and told him to "get back to work." I promptly returned everything in my arms to the shelves and left. I've never been back. Hi, Alan. I like ABC, although I don't buy books anymore - I use the library. Nevertheless, I have fond memories of the place since they took my comic collection off my hands years ago, and I got thousands of bucks. If I'd kept the books, they'd be destroyed now, so I made the right decision to sell. Too bad you had a bad experience with them. I'm maybe a little more outspoken than you, because I would have told the manager to go away, the guy is helping me. I'm just saying it would have been nice to acknowledge me as a paying customer as opposed to having a conversation over my shoulder with the gentleman behind me who they were obviously familiar with. In my times as a customer service representative, I took great pride in giving EVERY customer my full attention and not just the ones dropping big cash. I'd be more inclined to make bigger more frequent purchases from an establishment who treated every transaction as an important one. Quite frankly Ryan, your opinion and experience means little to me as it has no bearing on the complete dismissal I received. I'm just telling people why I will never go back into that store. They obviously won't care becuase they proved how little they cared when I did go in. Also not a shill. A regular customer who has never had a problem getting a question answered from someone on staff (even if the person I'm asking doesn't know, they'll ask around and see if they can help me). Frankly, given my routine experience at the store, I'm curious what exactly happened to the folks who had a bad experience. A quick transaction at the cash register doesn't exactly sound like something bad happened, especially if a queue was forming, but I may be missing something. I've shopped at Atomic in Arizona, Forbidden Planet in London and Comic Relief in Berkeley, and ABC hangs with (or surpasses) any of them on selection, staff knowledge and professionalism. What's the going rate on buying these advertisement "stories" on CNN these days? Back in my time, it was 'bout tree fitty. I've been to Austin Books & Comics. Terrible customer service. Funny, I've been to Austin Books and Comics, too, and I love the place and the people in it. 🙂 Weekly customer since 2006. I've found the service to be quite pleasant and they also do really fun special events for certain holidays, movie premieres, and comic releases. Sorry you haven't experienced it in the same way. Agree with Amy. One of the best staffed comic shops I've ever been in with one of the most knowledgeable and helpful folks behind the counter. I'm sure its possible to have an experience where a question couldn't be answered immediately, but I've only ever seen the ABC staff engaged with customers and extremely professional. I've found it to be much like every other "too cool for school" local business in Austin: rude employees, marked up merchandise, and a general smugness that keeps me ordering my comics online. Perhaps if they fostered a decent relationship with repeat customers and the management didn't berate the plebes in full view and hearing of everyone in the place I'd go back, but....no. While my experience was not exactly like Ray's, I found the person behind the counter to be dismissive of my meager 2 comic book purchase. He did seem awfully eager to serve the sweaty fat guy behind me with the 30 books. Maybe it was because I wasn't a weekly customer. I don't know and I guess I never will. It was my first and last visit. There will never be another. I think Amy and Ryan are shills for this comic book store, it's very transparant. LOL, nope. Just a fan and frequent visitor... who has a bit of free time today due to December doldrums. You could get more of an idea of people's experiences by looking at Google Places (http://maps.google.com/maps/place?cid=4357722863615698754&hl=en) and Yelp Austin (http://www.yelp.com/biz/austin-books-and-comics-austin). I actually posted a Yelp review of them a while back, but I've also posted dozens of others. I was hoping to avoid the shill appearance by using my actual name. Ah, well. On a less reactive note, I think one of the more positive takeaways from a post like this is that comic shops are not always just places where people go for comics– they can be places where people go to find a wide range of things that tie into a lot of different aspects of our culture, pop, low-brow, alternative, and otherwise. Also a regular, longtime shopper at Austin Books. I'm curious as to exactly what happened that led to the complaints as they don't mesh with my experience at the shop. A speedy transaction at the register when a queue was forming doesn't sound like a bad experience, unless the goal was to hang out and talk about your purchases at the register. Which does seem like an odd request if someone was standing behind you with purchases to make. If I'm shilling, its because I am actually quite a fan of the store. Its run as well or better than any shop I've been in, including Atomic Comics, Forbidden Planet and Comic Relief and is a model for other shops. I feel very lucky to have it this store in my city, and would want to offer a counterpoint to someone who has been in the store just once but wanted to make sure they got their negative comment in. What, we're not supposed to say anything good in a comment section or we're on the payroll of the shop? Almost every week I see the staff helping someone out who is new to the store, asking them about their tastes or the tastes of the person they're shopping for, and having conversations (away from the register) to help folks out or discuss the stuff they like.